"You could be forgiven for thinking Jonathan Green is one of my favourite writers as I've reviewed more books by him than by any other author on this blog. 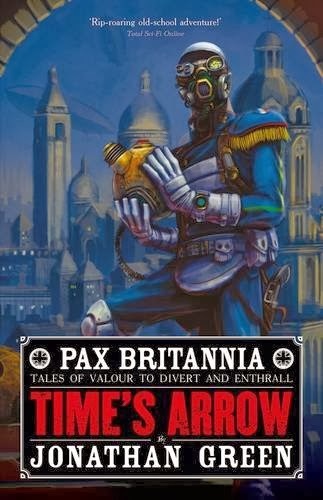 I've reviewed three of Green's other 'Pax Britannia' novels with their dashing dandy hero Ulysses Quicksilver: Blood Royal,Dark Side and Anno Frankenstein. I said in my review of the latter that it showed a lightness of touch not evident in the earlier novels. Time's Arrow shows a similar playfulness, while returning to the more Victorian setting of the ones beforeAnno Frankenstein. I really do think it's the strongest book in the series so far. I don't think Green is one of my favourite writers yet, but if he carries on writing like this he'll definitely be on my must-read list." The Crinoline Robot's reviews of my other books aren't quite so flattering (other than the one about Anno Frankenstein) but at least it would appear that I'm improving with every book, which can only be a good thing. To pick up your own copy of Time's Arrow, click this link.